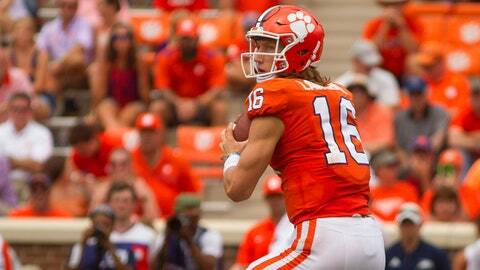 September losses can all but kill a Heisman Trophy campaign. It's why there have been just four winners since 2000 who suffered a defeat in the first month of the season, an early margin of error that basically turns these matchups into de facto elimination games. The SEC had one of its own last weekend, with Georgia's duo of contenders in Jake Fromm and D'Andre Swift beating Missouri's Drew Lock in emphatic fashion. Now it's the Big Ten's turn, as Dwayne Haskins and No. 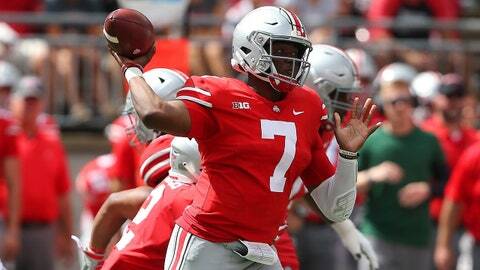 4 Ohio State head to Beaver Stadium to face No. 9 Penn State and Trace McSorley. To be clear, there is precedent for losing a head-to-head September matchup and still making it to the ceremony, something Boston College's Andre Williams did in 2013 despite a first-month loss to eventual winner Jameis Winston and Florida State. But before that, you have to go back to Kansas State's Michael Bishop reaching New York despite a first-month loss to Ricky Williams and Texas in 1998 ... so it's exceptionally rare. 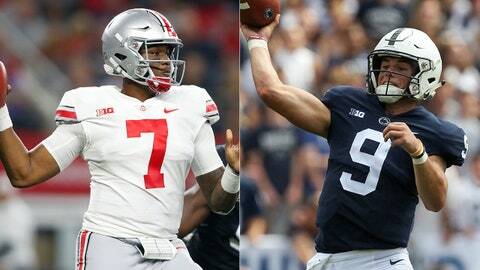 The Big Ten place in the College Football Playoff pecking order was already weighing heavily on this one, but considering two of its other players in the trophy talk -- Wisconsin's Jonathan Taylor and Michigan's Shea Patterson -- both have losses and another -- Buckeyes running back J.K. Dobbins -- has a more likely contender on his own team in the Haskins, the conference may be down to just one major challenger after Saturday. This trophy business -- as the great Jim Ross would say -- is about to pick up, especially in the Big Ten. Before we dig into the players who are poised to rise and fall in the race as we head into Week 5, here's a breakdown of where this voter's virtual ballot stands. In the wake of Trevor Lawrence being named the starter, Kelly Bryant -- who was at the helm in helping the Tigers return to the national title game -- has announced his intention to transfer. This expected changing of the guard only aids Lawrence's campaign, but a major hurdle remains given his age. Despite Johnny Manziel in 2012 and Jameis Winston in '13 winning during their first years of playing time, no true freshman has ever won the award. Lawerence, though, who is the only freshman in the top 25 in pass efficiency (eighth at 191.8) is in position to make some major noise with the Tigers seemingly without a rival in the ACC this season. Third in the nation in pass efficiency at 207.0, and trailing only Tagovailoa (230.5) and Grier (215.8), Haskins is the only one among that trio that has faced a team currently ranked higher than 47th in team pass efficiency defense in TCU (44th), which he carved up for 344 yards and two touchdowns back on Sept. 15. Now he'll see a defense that by the numbers is effective vs. the pass -- Penn State ranks 29th in FBS in both yards allowed (173.3 per game) and pass efficiency defense (109.9) -- but hasn't faced a QB like Haskins, who is 10th in yards at 1,194, to go along with that efficiency. Beating the Horned Frogs in a tough road environment isn't exactly Happy Valley for a Whiteout game, but the Ohio State passer seems poised to step up in a marquee matchup. We thought we were going to have to wait for a gauntlet of a November schedule before Grier got a chance to face off against a Top-25 opponent, but Texas Tech's surprising rout of Oklahoma State in Stillwater changed all that. To his credit, the Red Raiders own QB, Alan Bowman, has been spectacular, leading the country at 389.3 ypg. But his defense is statistically the Big 12's worst against the pass, coming in 109th in FBS in allowing 284 ypg, and last season they were torched for 352 yards and five touchdowns by Grier. The cancellation against NC State due to Hurricane Florence robbed Grier of a spotlight game, but this surprise gift should be a chance for him to close the month with a statement. 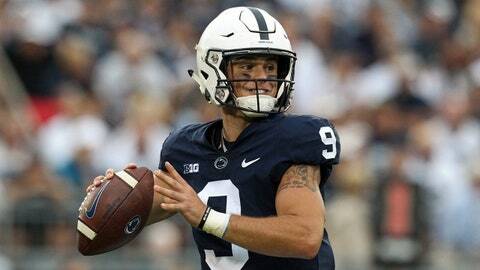 If Haskins emerges from Beaver Stadium with a victory, McSorley's chances are going to take a major hit. While he was exceptional late in surviving Appalachian State in the season opener, the senior simply hasn't had to get into a shootout this season. Despite running for a career-high 92 yards of his own, McSorley largely took a backseat to Miles Sanders in Champaign against Illinois, and his current efficiency rating of 135.4 is a major step back from 2017's 153.7, which was 11th in the nation. Even if McSorley puts this offense on his back, given the Nittany Lions' largely suspect defense -- which is 45th (345.8 ypg) while playing a mediocre schedule -- he may not be able to make up for the hole his defense puts him in. It's been discussed in this space before that missing a single game has been a death knell to all but five winners -- but a benching? 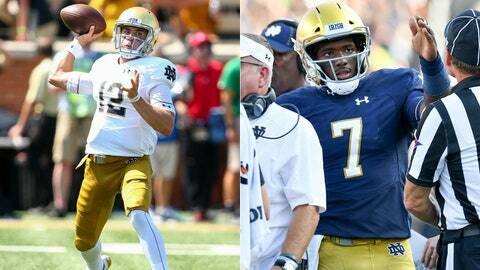 Ian Book got the start last weekend for the Fighting Irish against Wake Forest at QB and more than took advantage in accounting for five touchdowns, while Wimbush didn't take a single snap behind center. Wimbush is somehow still getting odds via sportsbook Bovada, but he's done, especially if he's not a major factor with No. 8 Notre Dame facing its first top-eight matchup in South Bend since 1996 when it meets seventh-ranked Stanford on Saturday. Meanwhile, having not seen the field in the first two games of the season against Michigan and Ball State, and attempting just three passes against Vanderbilt, would seem to make Book a non-factor as well no matter how big a factor the Irish are in the CFP conversation. 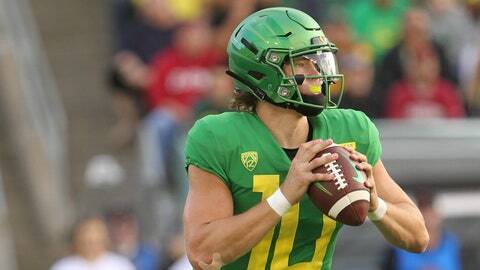 He's already been hit with a September loss with the Ducks coughing up a 24-7 lead against Stanford, and with an already slim margin of error he now has No. 24 Cal and No. 11 Washington in back-to-back games. While the Golden Bears defense has been statistically impressive -- ranking 16th overall (302.3 ypg) and second in the Pac-12 -- they haven't exactly played a list of juggernauts with North Carolina, BYU and Idaho State. 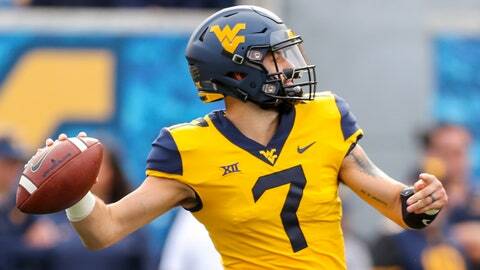 Herbert may well rebound with a road win, but things aren't currently trending in his favor.